ALL COVERED FACE FOUNDATION | INGLOT - Norges beste makeup-butikk! All Covered Face Foundation is an another approach to prove that flawless skin without unwanted mask effect is possible. 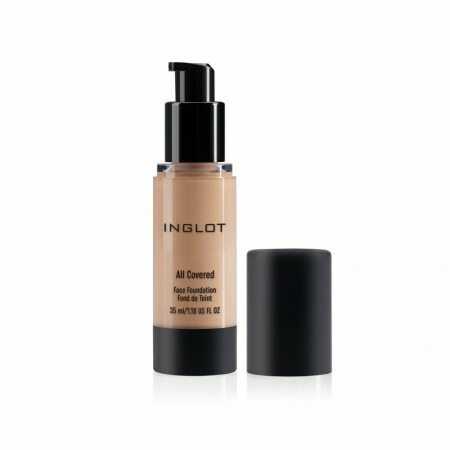 Ensuring perfect coverage, the foundation covers visible imperfections and effectively evens out skin tone. A lightweight formula, being effortless to apply, leaves the skin with a natural and radiant look. The carefully chosen ingredients care both for the skin and impeccable final effect. Saffron extract so called ‘red gold’, bioactive peptides and marine exopolysaccharide make sure the skin elasticity is visually improved, through their lifting, smoothing, and moisturizing properties. Lily extract and vitamin E additionally add protective and moisturizing properties. Its water-resistant character and the inclusion of beneficial film formers make the product long-lasting and working well in different outside conditions like gym or hot and humid climatic conditions. The product allows for building the coverage from medium to strong, depending on individual needs and application. An airless packaging of 35ml ensures easy application till almost last drop and a microbiological safety.